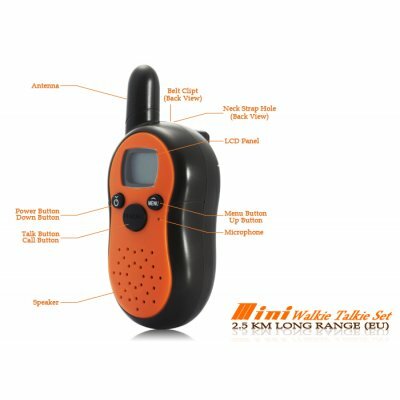 Successfully Added Mini Walkie Talkie Set - 2.5 KM Long Range (EU) to your Shopping Cart. With 8 channels to choose from, this powerful walkie talkie set enables you to talk with more than 20 people at the same time. Easy to use, and reliable when mobile signal is not available, these are short-range communication devices to keep in contact with your team anytime anywhere. These are the cheapest walkie talkie set on the market, and what’s even better, they come with Chinavasion’s famous 12 month warranty. Order your sample today and get it within a week, wherever you are! Brought to you by your source for low price high quality electronics, Chinavasion. Communication transmission and reception are ideal in open areas (up to 2.5 KM). Under confined environments such as inside warehouses or other buildings, the maximum range may be limited to approximately 1KM.